In the interest of serving mankind and reporting on our monthly lunch club adventures by touring Southern California’s most legendary restaurants, we have occasionally sacrificed food quality for a stroll down memory lane. We decided it was time to replace some of those palate-numbing experiences by eating at a place that has become synonymous with elegant dining—Chinois on Main in Santa Monica—which became an L.A. institution shortly after opening its doors in 1983. Wolfgang Puck’s sequel to his landmark Spago restaurant provided his introduction to “Asian-fusion” and was praised by critics as innovative and imaginative. Don’t get me wrong, I’m not one of those Westside food snobs. My dining habits range from chowing down on local take-out as I sit behind my TV tray to eating while standing over the kitchen sink. My lack of sophistication regarding food runs so deep that I discovered recently that arugula was not an African country bordering Namibia. I’m hoping our lunch group doesn’t come off sounding like a bunch of martyrs about our recent outings, but several of the meals we’ve been served in some of the most famous restaurants in town had about as much flavor as I’d expect to find in marinated balsa wood. Before our trip, I was able to secure a second mortgage on my Palisades home in hopes of meeting my first downpayment toward our upcoming lunch there. The bank also allowed me to offer my stylish Dodge Minivan as collateral. After personally delivering the loan documents to the Chinois maîtred’, we were allowed to make a reservation for four. Having lunch at a place that offers healthy fare turned out to be timely because our friend Arnie had suffered a health setback since our last outing. As part of his new regimen, the doctor had strongly encouraged better eating habits, so it was fortuitous that at this classy joint we were not given the choice of burger and fries. The servers at Chinois traditionally recommend ordering several entrees and sharing the dishes with tablemates. Three of us decided on that option while Arnie chose the Chinois Chicken Salad to keep his cardiologist happy. As our orders began to arrive at the table, we fought over Barry’s tasty order of “Sizzling Calamari Salad.” Even though he has always had an aversion to crab, I talked him into trying Chinois’ soft-shelled version, which has always been one of my favorites. Barry thinks crab is seafood’s tasteless answer to tofu, and considers it only a “place holder” for real food. He finally relented and begrudgingly said it passed his taste test. The barbequed baby spare ribs with sweet and sour teriyaki sauce were terrific, but I broke my own longstanding rule about eating them in public. I’ve declared that any restaurant that offers finger food doused with barbeque sauce should be required to offer shower facilities for its customers. Although I’ve never been comfortable eating a fish that is staring back at me from the plate while I’m jabbing a fork into its side, I made a one-time exception for Chi- nois’ “Whole Sizzling Catfish” entrée with ginger and ponzu sauce. We ordered vegetable fried rice with the dish and by the time we finished off the poor fish, his empty stare of quiet resignation was secondary to my satisfied contentment. 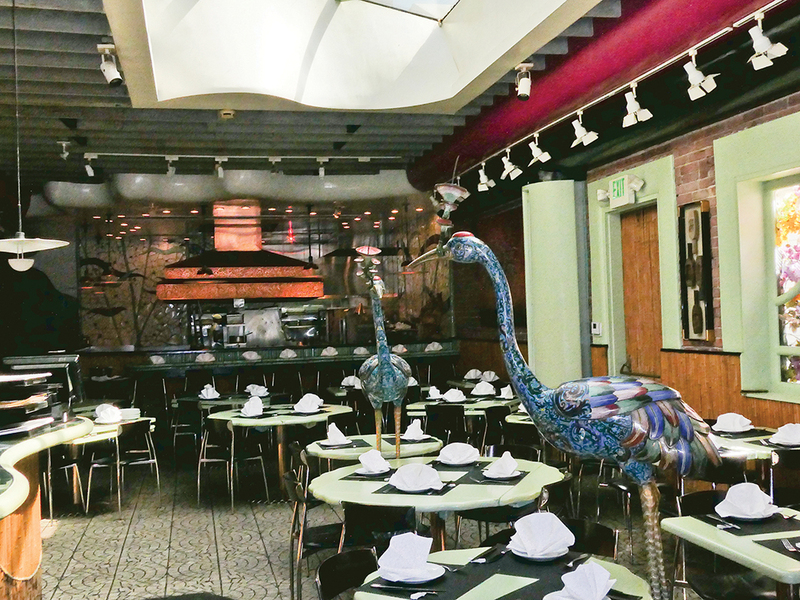 After becoming quickly seduced by the elegant cuisine of upscale bistros like Chinois and Spago, we began to later reminisce about previous outings at L.A. landmark restaurants. We fondly recalled those red vinyl booths and the flocked wallpaper at Musso and Frank’s Grill, and that mouth-watering lobster salad from the Polo Lounge. We occasionally acted like out-of-town tourists when we visited several of the city’s vintage hotels like the Chateau Marmont and the Hollywood Roosevelt. We marveled at their classic architecture and style—including their dark, mysterious lobbies and winding corridors with marble floors and decorative tiles. It appears that it is time now to return to our original scheduled programming. Bob Vickrey is a longtime Palisadian whose columns appear in several Southwestern newspapers, including the Houston Chronicle. He is a member of the Board of Contributors for the Waco Tribune-Herald and a regular contributor to the Boryana Books website.